And some of these things were deliberate and some... not so! However on the whole I am pretty pleased with the page - and the story it tells. I wanted to add some stamping down the side and knew I had the perfect and underused set - Artistic Outpost Grunge London. They are red rubber which I hardly use these days which meant that I had to add extra features to hide the times I stamped upside down! I used a very dark brown and a lighter brown chalk ink pad to stamp with. 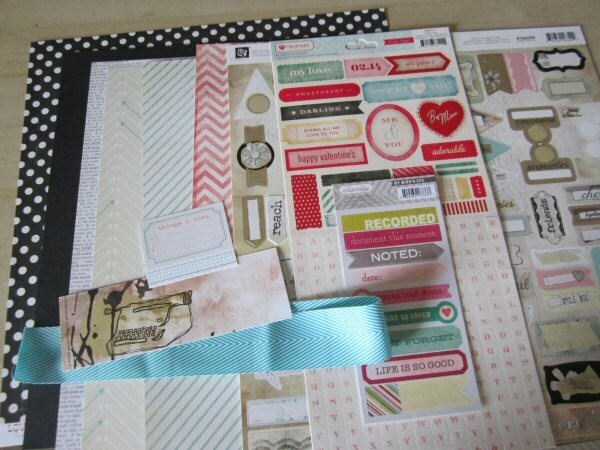 Then I picked out papers etc from the kit. Actually there is more "etc" than paper here - most of the photo mat is made up of the large airmail envelope and the material - both chosen because they are red, white and blue. 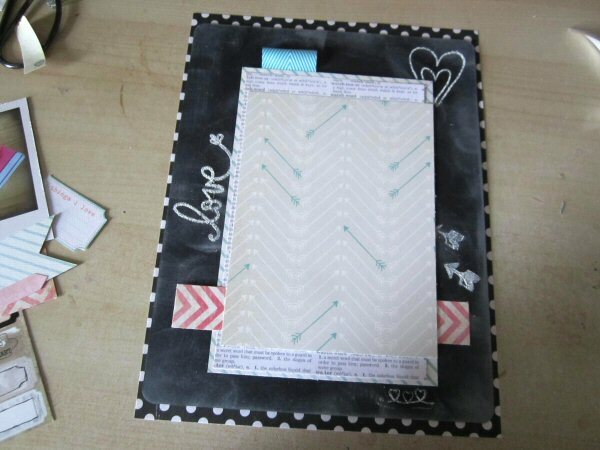 I also used one of the cute Shinzi Katoh notelets as a journalling spot. Once everything was adhered down I punched holes and hand stitched the material using tapestry wool. A few prima stickers, thickers title and punched hearts later and I was almost done. I reached for my 50p in the sale Wilkinsons stick on gems to add some bling for the special occasion. OK so in an earlier post about the new kits I mentioned one of the trends & techniques I wanted to have a play at this month is creating a layout with a chalkboard background. 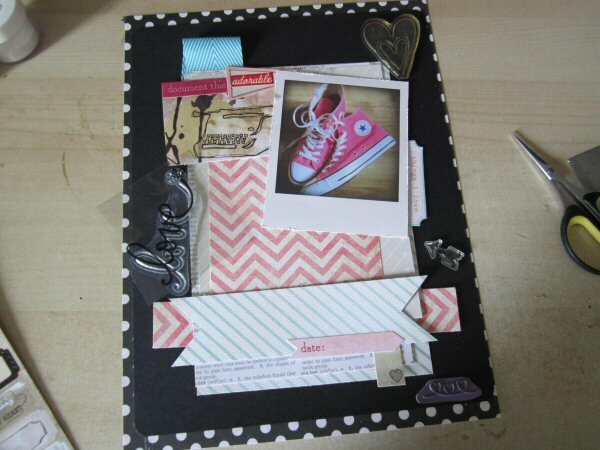 I've had a go at a few different chalkboard style techniques in cardmaking and thought it could work well on scrapbook page too. 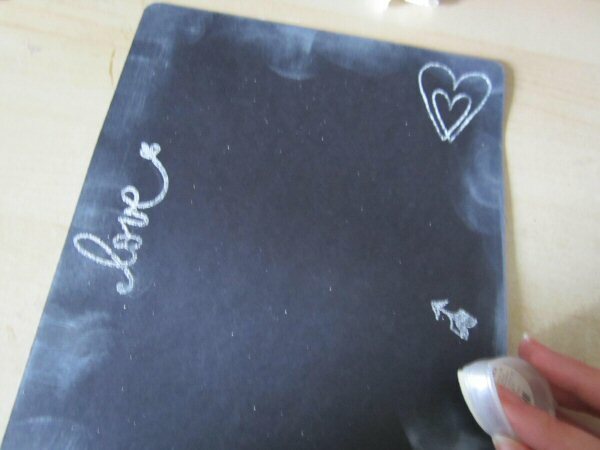 There are lots of different ways you could make a chalkboard style background but this is how I've done mine. 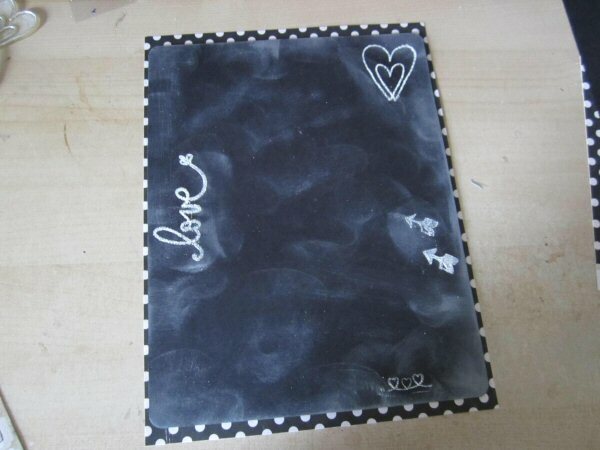 For the chalkboard background you'll need some stamps to use. I picked out simple designs, hearts and arrows but you could use more intricate ones too - something like a pretty floral could work really well. 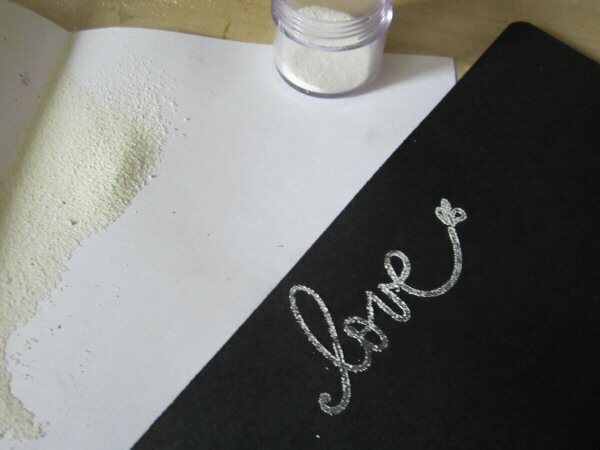 You'll also need a white pigment inkpad and white embossing powder with a heat gun to set it. I used a puff white embossing powder because I liked the texture better but a regular one would work too. The white inkpad I used was a Brilliance Dew Drop inkpad in Moonlight White. OK onto the layout. To begin with I cut out the Echo Park Love Story paper to be my layout base, (for this page I wanted to make a 8.5 x 11" size layout). 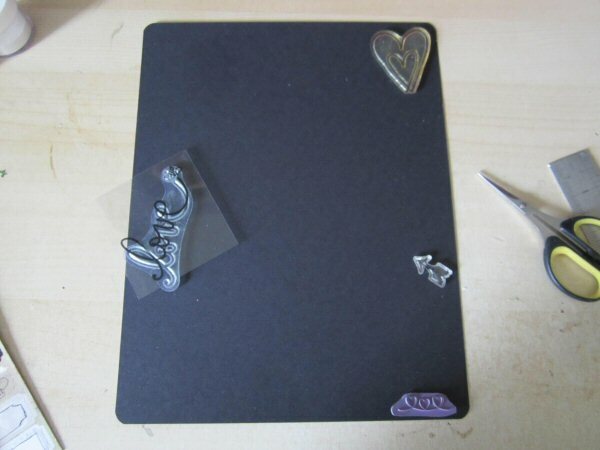 Then I trimmed down the black cardstock so it was just slightly smaller and rounded the corners. On top of that I then started to build up the layout using layers of the patterned papers - non of these are glued down yet this was just to get an idea of where to place the stamps on the background. Once I'd figured out the best position for the stamps I removed the papers leaving me with just the black cardstock to begin making the chalkboard background. First I used the white ink to stamp then the white powder to emboss the stamp images on the cardstock. Next using the inkpad I brushed ink around the edges and over the rest of the black cardstock. The foam pad on the inkpad I'm using meant it gave a soft finish but if you have an inkpad with a felt pad use a piece of kitchen paper or cotton wool to brush the ink around the edges to make soft swishy marks like when chalk is brushed around a chalkboard. You can use kitchen paper to soften it or if you've used too much white add a little black ink over the top to blend it back. Once you're happy use the heat gun to set the ink. 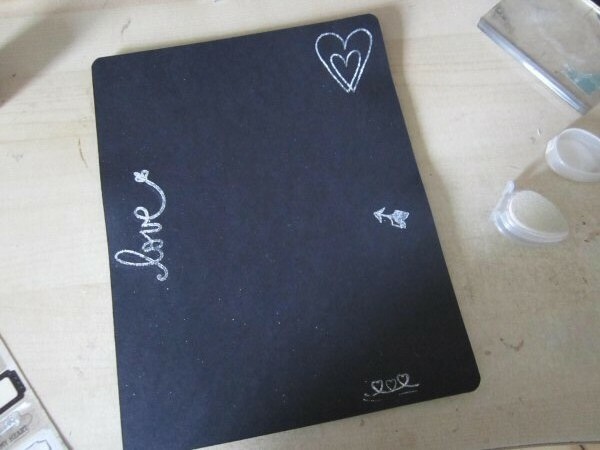 Once I'd finished the chalkboard background I used 3D foam pads to adhere it to my layout base. Next I used the papers I'd cut earlier to rebuild up the layout this time gluing them down. So this is just one way that I used to create the look of a chalkboard background. 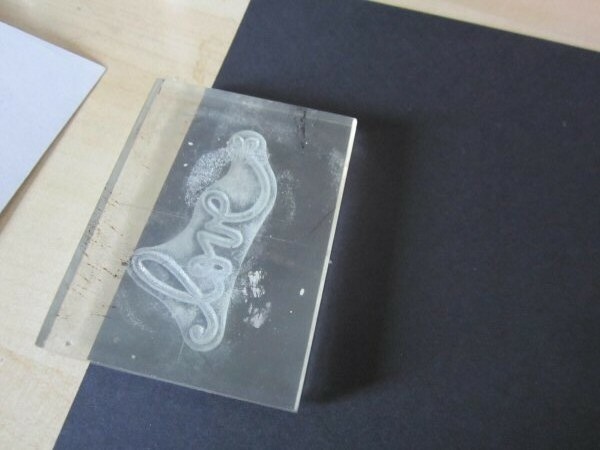 An alternative method you could try is to use a clear inkpad, (like a Versamark) to stamp you images and use real chalk to brush over the top. Another way I've created backgrounds for cards is to use an embossing ink pen and doodle on the images. 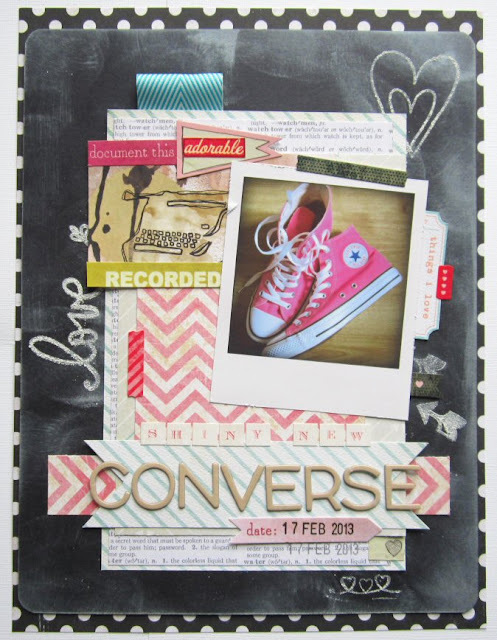 That technique could be a unique way to add journalling to a chalkboard layout too. Anyway hope it's given you some ideas to have a play with! the blog post title refers more to the brevity of this post rather than the time it took to make the layout - though considering all the layers, thanks to the wonderful Quirky Kit it all came together rather quickly. All I added was an X Cut embossing folder and ink to one piece of tracing paper and some blue mist to another piece which I then scrumpled up to look a bit like ribbon. Here are some detail shots and if you have any questions about what I did, please ask in the comments and I will respond when I can. I ADORE this kit and can't wait to do more with it! New kits are arriving this week and so it's time to get looking for cool inspiration. I've been browsing Pinterest and online galleries to pick out some inspirational pins for us this week to help kick start your creativity. I've been thinking of making a chalkboard as a background for a scrapbook page and I will be doing a chalkboard background tutorial for a Trends and Techniques post later on next week using the black cardstock in the kit. I've been using chalkboard backgrounds on cards and for greetings and I know it'll make a fun interesting background for a layout too. With the fabrics and different envelopes and paper embellishy bits in the main kit one idea could be to layer them up together like this in this layout. This really caught my eye I love the segments and the idea of putting something in each one. It'd be nice to maybe add interactive sections like maybe little pockets too to a layout like this? The new kits are ready and are currently being packed to send out to subscribers this week so subscribers watch out for your shipping notification emails! 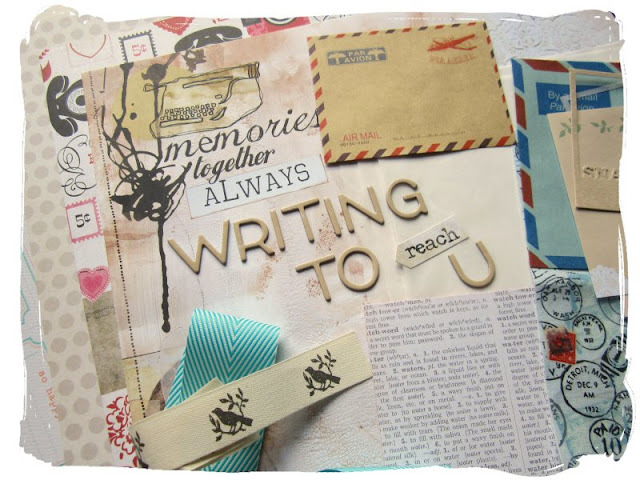 The main kit is 'Writing To Reach You'. It was inspired by a bundle of vintage letters and it encompasses a little vintage style with a little modern and features bold colours mixed with pastels. The flip sides of all the papers are a mix of blues and neutrals so you can get an alternative softer more modern look too. All the embellishments have been picked out to compliment both sides of the kit. I've picked out a few of the pieces of the kit, (black cardstock and tracing paper if you want to save them) to use for trends and techniques I'll be picking up on too so watch out for those demos and ideas popping up on the blog. The Quirky Kit Lite this month is 'Noted'. It's a contrast to the main kit with candy bright colours mixed with gold and complimented with greys. Subscribers will get their kits first then if there are any left over they'll be made available in the shop as single kits. Keep a peek here for all your Quirky Kit inspiration over the next couple of months!